Contains lesson plans for 10 sessions that include age-appropriate activities. These fun and engaging activities enable young children to approach highly sensitive and painful topics. Grief is a Family Process. A Note to Group Facilitators. Sample Telephone Interview. Mourning Child Middle Childhood Curriculum: Week 1. Mourning Child Middle Childhood Curriculum: Week 2. Mourning Child Middle Childhood Curriculum: Week 3. 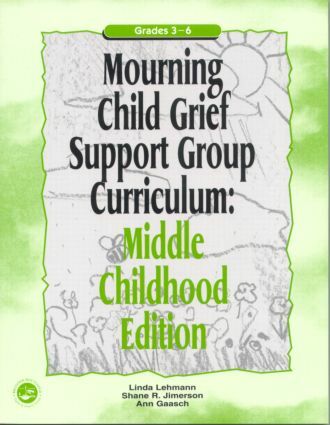 Mourning Child Middle Childhood Curriculum: Week 4. Mourning Child Middle Childhood Curriculum: Week 5. Mourning Child Middle Childhood Curriculum: Week 6. Mourning Child Middle Childhood Curriculum: Week 7. Mourning Child Middle Childhood Curriculum: Week 8. Mourning Child Middle Childhood Curriculum: Week 9. Mourning Child Middle Childhood Curriculum: Week 10. Appendix 1: A Description of Materials. Appendix 2: Samples of Materials to be Used. Appendix 3: Sample Notes to be Sent Home to Caregivers. Appendix 4: Special Activities for Special Days and Sample.